Transport Alliance was started on 23th Of February 2018 and added on AlexNews on 6th Of March 2018. I've $200 investment in this program for monitoring purpose. There are a fair amount of investors have chosen this program but not so many big investors. Transport Alliance is paying very high profit in a short time and I think that is why not so many big investments were made here. However, the total sum of investments is still a big amount and new investors are joining regularly. So, the program hasn't lost its attraction yet. The website of Transport Alliance looks nice and professional. The main attractions of this website are the images and sliding. There are some extra menus present in this website which we'll not see on regular HYIP sites. If you're little curious about cryptocurrencies (as Transport Alliance accept those) then the "BUY BITCOIN" menu can be useful for you. By the way, investment plans are present and described well at the proper place on their homepage. A useful "plan calculator" is also available though the plans are so simple. Rest of the website is also full with some standard articles and other site data. The website is fully compact without any error or broken links and its look like created by a professional person/team. Unfortunately, there is no video presentation/review available in the website. Communications also have some lacks as there is no Livechat option or skype/telegram available to contact quickly. But they've a twitter and facebook page with some activities. Investment plans are simple and highly profitable. There are 4 investment plans which are - 8%, 9%, 10% and 11% daily forever. Principal is included in daily profit. Minimum investment is allowed from $25 and there is no limit for maximum investments. From $25 to $4999 investments will get 8% daily forever. No doubt that this is the key plan for this program, other plans need at least $5000 to start with. I think there is not much explanation is needed for these plans. 104% of investments will be back in just 13 days and the real profit will start from then. 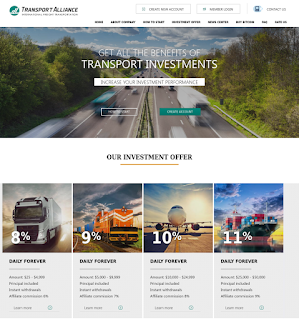 So, all you need is - invest in Transport Alliance and wait 13 days then start counting your profit. Keep in mind that this program is running from last 23th Of February and it has paid a good amount of profit to them who were joined early. By the way, there are 3 more plans which require big amounts to start with and I want to suggest you to avoid those plans. Transport Alliance accepts Bitcoin, LiteCoin, PerfectMoney, AdvCash & Payeer to invest in their project. Withdrawals are Instant. Technical specifications are OK. Transport Alliance is based on a licensed GoldCoders script which some modifications. Hosting and Ddos protection is taken from cloudflare. SSL is present for secure connection between the user and the server. An EVSSL would be more impressive. Well, most of standard HYIPs (which pay at least 8% per day) pay for a limited time. But Transport Alliance is paying 8% for lifelong which may produce a big profit. The admin is also looking serious about his project as he has chosen the best promotional strategies. But predictions are not always work in HYIP industry so invest less than you afford to lose.